Just 250m from the beautiful Kleopatra Beach, the Cleopatra Golden Beach Hotel is a luxurious family-friendly hotel in Alanya offering a comfortable stay amidst modern amenities and well-furnished rooms. 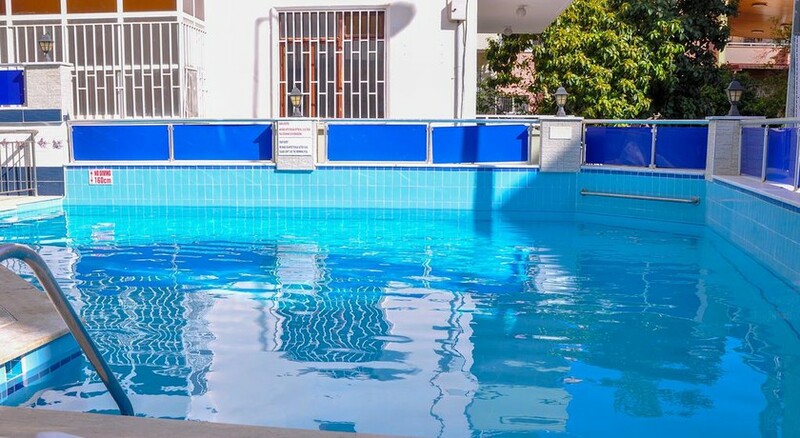 Featuring a seasonal outdoor pool and free Wi-Fi, the hotel is a favourite among couples and families thanks to its convenient location and warm hospitality. The hotel’s 106 well-appointed guestrooms furnished in contemporary style with a spacious wardrobe, satellite TV, en-suite bathroom with shower, welcome guests to take a well-earned rest. The guestrooms come with private balconies that offer magnificent views of the sea. The onsite restaurant serves excellent food for breakfast, lunch and dinner. Guests can enjoy their meals while admiring beautiful sea views. 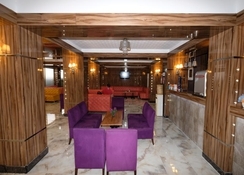 The Cleopatra Golden Beach Hotel is only 250m from a fine sandy beach in Alanya. 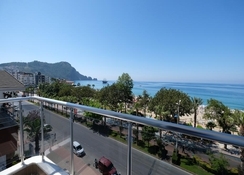 The Alanya Bus Station is 450m from the property. The Alanya Aquapark is only 1.5km away, while the Damlatas Caves are 1.3km from hotel. Alanya Archaeological Museum, Alanya Lunapark and Alanya Culture Centre are other tourist attractions that are within a 1.5km radius from the hotel. The nearest airfield – Gazipasa Airport, is about 45km from the property. The Kleopatra Beach in Alanya is among the most famous beaches in Turkey. This is a 2.5km long pebble and sandy beach located in the heart of the city. Many good restaurants, bars and shops are in the vicinity making it a tourist’s delightful. The lovely promenade is a laidback meeting place for the young and old. Tourists can make themselves comfortable on a bench by the fountain, watch children play on the playground or engage in any of the activities on the beach or in the water. 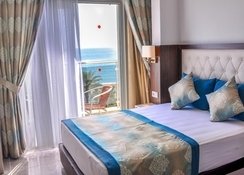 The Cleopatra Golden Beach Hotel features 106 well-appointed rooms furnished in contemporary style and painted in shades of white, peach and crème. The spacious, ventilated guestrooms come with a spacious wardrobe, a satellite TV, an en-suite bathroom with shower, etc. The guestrooms also feature private balconies that offer magnificent sea views. 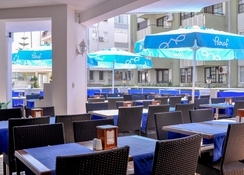 A buffet breakfast is served daily at the Cleopatra Golden Beach Hotel. The in-house restaurant specialises in Turkish cuisine. There is a snack bar that sells light bites and beverages all day long. Cleopatra Golden Beach Hotel has a seasonal outdoor swimming pool with a separate kids’ pool. There is a sauna and a Jacuzzi too, and the hotel offers massages and therapies. There is a barber and beauty shop onsite where various treatments and therapies are offered. The hotel has a games room and library as well.